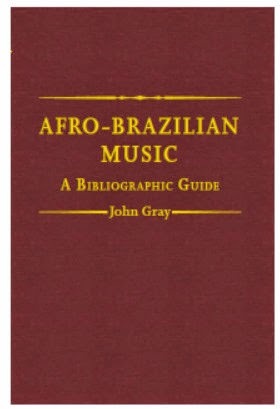 On receipt of Afro-Brazilian music; A bibliographic guide, by that master and prolific bibliographer, John Gray (Nyack NY: African Diaspora Press, 2014; ISBN 9780984413447), my initial reaction was overpowering, and remains so. While my review is scheduled for publication by the American Library Association's journal, Choice, this seemed an ideal moment to give a brief thought to that important country whose past is destined to be even more important in the future. There has been much controversy on terminology. Preto (7.6%) would be the American equivalent of "Black," while pardo (43%) would acknowledge those of mixed ancestry -- while in fact both groups share similar sociology and cultural heritage. Slave revolts became so numerous and violent that the its formal abolishment in 1888 was the only solution. One year later saw the première at Rio's Teatro Lirico of O escravo (The Slave), by Brazil's major opera composer, Carlos Antônio Gomes, who was deeply admired by Verdi. Even more popular was his 1870 opera, Il Guarany, also treating race relations in Brazil (recorded on Sony S2K 66273 in 1994 with Plácido Domingo), whose arias were within the repertoires of Enrico Caruso and Bidú Sayão, and whose Brazilian flavored overture was a favorite, even when arranged for band. Performers: nota bene! To fault a reference book for what is not included, however popular that might be with many reviewers, is always a possibility. My thoughts are to evaluate what is present, not what is absent.. Because followers of this site have the concert tradition as interest in common, it should be noted that Gray does not lose his focus on the folk music: This is not the place to look for information on Gomes, Nunes Garcia, or even Villa Lobos. But it is obligatory for background data. The specialist will find the 585 pages packed with classified data on the subject (3,731 entries) and certainly worth the price ($124.95). They will also be quick to add the diacriticals which have been ignored. For others, expect your campus or major city library to have this volume on the shelves very soon. If it is feared the publication has been overlooked, alert the acquisition department with the ISBN number.